A Paradise Built in Hell: Rebecca Solnit on "The Extraordinary Communities that Arise in Disaster"
REBECCA SOLNIT: You know, a lot of my work has been based on the field of disaster sociology, which emerged after the World War II, when the US government decided it wanted to know how human beings would behave in the aftermath of an all-out nuclear war. The assumption, as it often is, is that we would become childlike and sheepish and panic and be helpless, or that we’d become sort of venal and savage and barbaric. And the disaster scholars started to look at this and eventually dismantled almost every stereotype we have and found that people are actually, as I’ve been saying, resourceful, altruistic, brave, innovative and often oddly joyful, because a lot of the alienation and isolation of everyday life is removed. And, you know, you saw that in the 1906 earthquake, which I studied a lot for the centennial a few years ago, that people created these community kitchens, that they were extremely resourceful and helpful. And you see that all through. You see that in Mexico City. You saw that in 9/11. What you also see is that because the authorities think that we’re monsters, they themselves panic and become the monsters in disaster. Some of the sociologists I worked with—Lee Clarke and Caron Chess—call this “elite panic,” and that’s the panic that matters in disasters, the sense that things are out of control; we have to get them back in control, whether that means shooting civilians suspected of stealing things, whether that means focusing on control and weapons as a response, rather than on help and support or just letting people do what they already are doing magnificently. And so, it really upends not only the sense of what happens in disaster, in these extreme moments, but I think it upends our sense of human nature, who most of us are and who we want to be. There’s enormous possibility in disaster to see how much people want to be members of a stronger society, to be better connected, to have meaningful work, how much everyday life prevents that. He calls himself Hilby, “the skinny German juggle boy,” and that is the first big wink at his audience, a signal that he will be poking fun at himself as well as at the conventions of his trade. In his act he juggles both words and objects, including, at one rivetingly absurd point, a bowling ball, a toilet plunger and a cordless hedge trimmer. He maintains a fast-paced comic banter, gently mocking himself and his audience, especially its desire to see him fall or get hurt. (“Americans love accidents.”) He is highly skilled technically but does not mind dropping things because comedy, he believes, is more entertaining than precision (a view, he said, that his occasional all-German audiences do not share). Offstage Mr. Hilbig is an earnest, mellow, yoga-practicing father of two who lives in Ithaca, N.Y., with his girlfriend, a photographer who has two children. 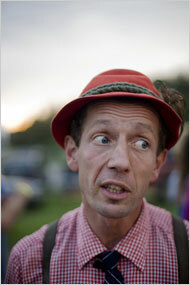 On official forms he lists his occupation as clown, and from Memorial Day to Labor Day every year he is one of hundreds of variety entertainers — jugglers, magicians, hypnotists, mentalists, impressionists, Dadaists — who travel the fair circuit, bringing, to borrow a German term, echt performance art to the land. In truth, that is not what Mr. Hilbig felt when he first arrived at the Fayette County Fair, a new booking secured by his agent. (Yes, clowns have agents too.) He found the setting dispiriting. His stage was strewn with litter and the small sign advertising his presence, “The Herald-Standard presents Hilby the Skinny German Juggle Boy,” hung above a trash can. Further, Mr. Hilbig worried that Fayette County was “not exactly my demographic.” His show works best, he said, in areas where Priuses outnumber pickup trucks. He likes to bait his audiences when they do not laugh by saying that his humor requires at least a high school education, but in Fayette County, where a quarter of the population over 25 does not have one, that would not be terribly funny. Gradually, however, the place grew on him. He found the livestock auction fascinating, the monster trucks impressive and the large Army recruiting station, in an area where unemployment is especially high, “depressing but real.” He admired the majesty of the lions and tigers and befriended their handler, Clayton Rosaire, a 10th-generation wild-animal trainer from Sarasota, Fla.
During the five days he worked the fair Mr. Hilbig drove his minivan from his motel to the fairgrounds each afternoon and changed into his lederhosen in the back of the fiddlers’ hall. When the “Pigs Gone Wild!” race started blasting “Sweet Home Alabama,” he readied his own sound system and loosened up by chatting with early audience members. Before one show the fair’s queen and princess, in matching tie-dyed T-shirts, settled into the front row. “By the way, girls, the next time you do laundry, you should really separate the colors from the whites,” Mr. Hilbig called out to them. The girls laughed, adjusting their purple pageant sashes; they were itching to be selected as volunteers. But alas for them, Mr. Hilbig chose instead a dimply young girl named Madison (“Is that your mom there, Madison, taking pictures for the insurance claim?”), a corrections officer from the town of Fairchance (“Wow, that must really stink being a prisoner in Fairchance”) and a burly, tattooed electrician (“Can I call you Papa Smurf?”). As he balances swords atop knives in his teeth and mounts six-foot-tall unicycles, Mr. Hilbig especially likes to tease men. He prances around the stage and (during fire juggling) refers to himself as “a flaming German.” He squeezes men’s muscles, blows them kisses and urges them to hug to the song “Feelings” — although in Fayette County he never coaxed more than a handshake from his male volunteers. Sometimes Mr. Hilbig’s friends tell him he is “so good he should be famous.” But Mr. Hilbig, shrugging, said, “Famous doesn’t really exist in terms of juggling.” He is content, he said, to be his own boss, to earn a decent living (“I do fine; I can buy organic vegetables”) and to savor the sweet moments when he electrifies an audience. Over the years he has developed a loyal following, and in Fayette County he added at least one particularly ardent fan: Mr. Galbraith, the retired steelworker, who attended 11 of his 15 performances, crying out “Wow!” and “Ha ha ha!” and “Hot pants!” (when Mr. Hilbig crouched over a flame). In fact, our mature brain seems to be programmed by our childhood experiences — we plan based on what we’ve learned as children. Very young children imagine and explore a vast array of possibilities. As they grow older and absorb more evidence, certain possibilities become much more likely and more useful. They then make decisions based on this selective information and become increasingly reluctant to give those ideas up and try something new. Computer scientists talk about the difference between exploring and exploiting — a system will learn more if it explores many possibilities, but it will be more effective if it simply acts on the most likely one. Babies explore; adults exploit. Each kind of intelligence has benefits and drawbacks. Focus and planning get you to your goal more quickly but may also lock in what you already know, closing you off to alternative possibilities. We need both blue-sky speculation and hard-nosed planning. Babies and young children are designed to explore, and they should be encouraged to do so. But what children observe most closely, explore most obsessively and imagine most vividly are the people around them. There are no perfect toys; there is no magic formula. Parents and other caregivers teach young children by paying attention and interacting with them naturally and, most of all, by just allowing them to play. A prominent Washington lobbying firm has acknowledged sending forged letters to a Virginia lawmaker urging him to vote against the House climate change bill. The lobbying firm Bonner & Associates sent letters to the office of Democratic Congressman Tom Perriello of Virginia that appeared to be from members of the NAACP and the Latino organization Creciendo Juntos. The letters urged Perriello to vote against the climate bill in order to protect minorities from higher energy bills. The fake letters appeared on letterhead from the NAACP and Creciendo Juntos and were signed by made-up individuals. The lobbying firm claimed that the letters were sent out in error by a temporary employee, but the firm has a history of what’s called “astroturfing,” misrepresenting corporate-backed policy as a real grassroots movement. The company has refused to say who was paying for the campaign to derail the climate change bill. Clients of Bonner & Associates have included Citicorp, Aetna, PhRMA, Dow Chemical, AT&T, and General Motors. In the end, the effort failed. Congressman Tom Perriello voted for the legislation.